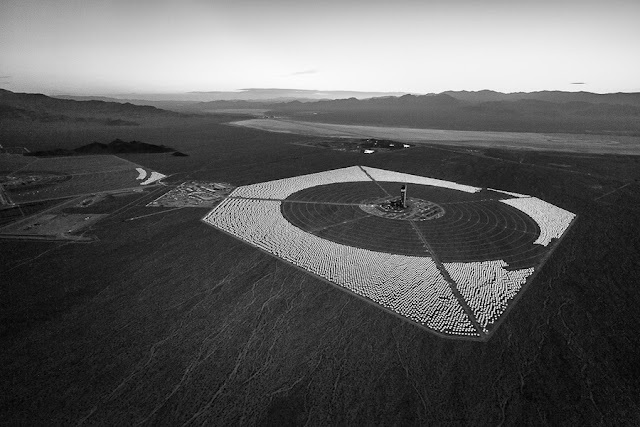 Earlier this year Jamey Stillings came into photo-eye Gallery to show us his new body of work, Evolution of Ivanpah Solar, in which he documents the construction of the world's largest concentrated solar thermal power plant. Stillings' exploration of the power of the sun sparked an idea, and the Solar exhibition came to be. The Solar exhibit includes a collection of photographic interpretations of the sun by photographers working in a variety of unique processes ranging from historic to contemporary techniques. Included are antique images of solar eclipses printed by Linda Connor from glass plate negatives drawn from the archive of the Link Observatory, and also the work of Alan Friedman who uses small telescopes, specialized filters and high speed streaming cameras to record the features of the sun. Sharon Harper's photographs draw on scientific and artistic uses of photography to illuminate existential concerns, embracing photography’s contradictory ability to verify empirical evidence and evoke fantastical possibilities. Photographer Chris McCaw builds his own large format cameras, places vintage silver gelatin paper into the film holder (instead of film) and leaves his lens open for an extended period of time. 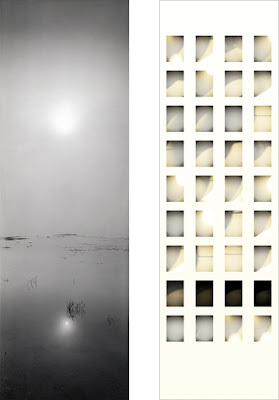 Because the lens is open for so long, the sun burns into the photographic paper, at times creating holes, and inverts the image from a negative to a positive, a process called solarization. Becky Ramotowski works in a similar, but different and equally unique manner. Ramotowski builds tiny pinhole cameras, which are left in the landscape from solstice to solstice. The result is a small paper negative that is scanned to create a (slightly) larger print that is a record the suns path over a six-month span. Time is also an element in David H. Gibson's sunrise studies of Eagles Nest Lake, a place he has been returning to for over twenty years to observe the subtle changes that can occur in a matter of monuments based on light, time and weather. We hope that you will be able to stop by and view the work in the gallery. If you are unable to attend the exhibit we have just launched a new online portfolio featuring some of our favorite images from the Solar exhibition. In the upcoming weeks we will also be adding additional portfolios by individual artists and more information will be available on the photo-eye blog.